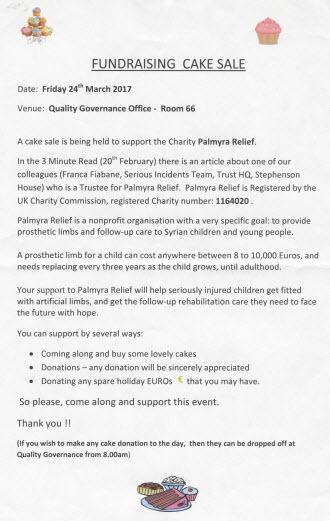 A 17 March Cake Sale held at the NHS Trust Quality Governance Office raised more than £150 for Palmyra Relief. Many thanks to everyone who donated and bought cakes, and donated their spare change to help seriously injured children get artificial limbs and rehabilitative care! This entry was posted in Other Issues on April 4, 2017 by palmyrarelief.